Hearthstone went on a huge card reveal bender on Friday and Shacknews is taking this week to catch up on the newest Grand Tournament expansion cards. Today, we look at the latest cards for the Warlock, Warrior, and Shaman. It's a big day for Hearthstone with this week's Tavern Brawl offering a sneak peek at the Grand Tournament expansion. So while players are busy checking out the new Mage and Hunter cards, Shacknews is continuing to break down the remainder of the expansion's cards, analyzing them by individual class before moving forth with the final batch of neutral cards. Today, we're checking out the latest cards for the Warlock, the Warrior, and the Shaman. How badly do you need to regain control of the board? That's the question that Dark Bargain poses and its drawback may be a little too much to bear. Zoolock hands may be able to do something with this if those players have already managed to empty out their hand prior to this card's use, but otherwise, this is a huge dice roll. It doesn't help that you won't get to choose which minions are eliminated, which could be a major problem if a heavy hitter is left standing. There are better minion removal options out there for 6 mana, with Siphon Soul immediately coming to mind. There is one combination to be on the lookout for, though. If you can make it so that Fist of Jaraxxus is one of the cards discarded, it may pack a little extra punch and make this play slightly more worthwhile. 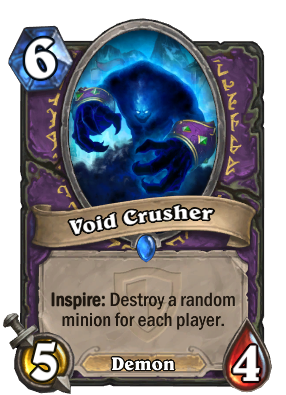 Void Crusher sounds like a decent play on paper, with a Hero Power card draw removing an opposing minion at the expense of one of your own. It sounds great until you realize that -- whoops! -- Void Crusher can actually destroy itself if there are no other minions at its side. That effect might be tough to swallow. So what's the best way to avoid this unfortunate turn of events? Well, while it won't necessarily guarantee Void Crusher's survival, Imp-losion is a good way to deal some damage and make it so that the Void Crusher's effect may only remove a single 1/1 Imp from your side of the board. Void Crusher is a roll of the dice and if it comes up snake eyes, then that's a brutal blow. Think very carefully before equipping this guy and maybe consider a different 5/4 minion, like Booty Bay Bodyguard. This is a nice attempt at synergy with the previously-discussed Dark Bargain, as well as Soulfire. 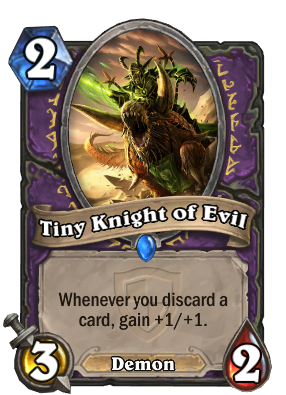 And even on his own, Tiny Knight of Evil's stats are comparable with most 2-cost minions. It'll certainly find a good home in Zoolock decks that typically empty their hand before doling out Soulfire. 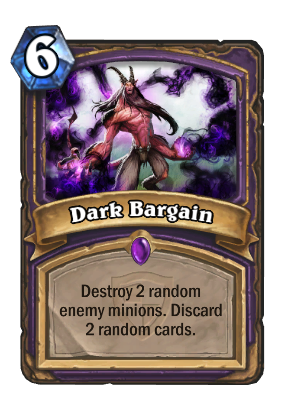 Can Warlock decks center around Tiny Knight of Evil, Dark Bargain, Soulfire, and Fist of Jaraxxus? Theoretically, they can. In fact, it'd be quite novel for a Warlock player to attempt this. Is it a practical idea? In a zoo, Warlocks can certainly do worse. This is something to keep an eye on over the comign weeks. Finally, the Warlock gets a straight, no-frills 7-cost minion. Its stat line is quite unique, in that it's hard to find good 7-cost minions with a massive 8 health. While Fearsome Doomguard doesn't have any particular effects of his own, his classification as a Demon will mean he'll be in high demand. If played alongside Mal'Ganis, his line goes up to 8/10, making him a formidable foe. He'll be a popular Voidcaller target, with Warlock players looking to get him onto the field long before Turn 7. And he'll also be primed and ready for any number of Demon-boosting spells, like Demonfire, Demonfuse, and Demonheart. 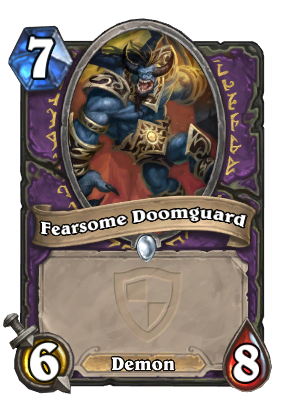 Fearsome Doomguard can be a huge force and just because he doesn't have an effect doesn't mean he should be taken lightly. 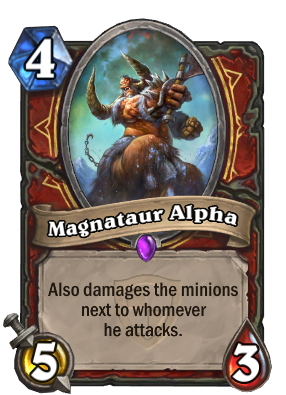 At a cost of 4 mana, Magnataur Alpha doesn't necessarily replace Kok'kron Elite, but that effect is definitely one to keep around in case of emergencies. Yes, that effect makes Magnataur Alpha a mini-Foe Reaper 4000. And yet, what if I told you that this guy can actually dish out more damage for a lower cost? That's right, simply combine Magnataur Alpha with Charge and let 'er rip. The hit will be good for 7 damage that will spread across three minions. Now unlike Foe Reaper, Magnataur's lowly 3 health likely means his trip to the opponent's board is one-way only. But that's about as solid as a kamikaze play can get. What do you do if you want to use Defender of Argus or Sunfury Protector, but you don't have two minions available to take full advantage of their effect? Settle for Sparring Partner, the third wheel of this particular group. 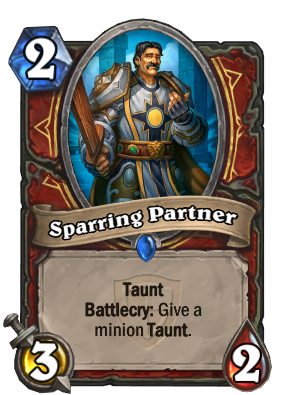 What do you do if you have a lot of Taunt minions and you've played your King's Defender? You sharpen it, of course. That's where Orgrimmar Aspirant comes in. As long as this guy is on the field, armoring up will pump up your current weapon, which will likely make King's Defender a nightmare of a weapon to deal with. 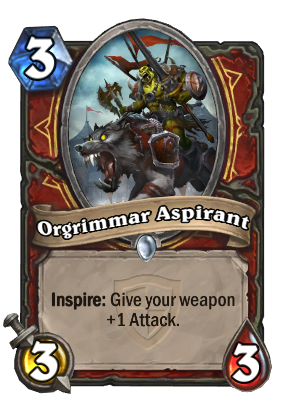 These 3/3 stats are half-decent, but that's not what Orgrimmar Aspirant's effect is there for. He's purely there to help the Warrior both armor up and sharpen his weapon. Not much else to say about him, but he'll definitely be someone to consider adding when packing in your King's Defender and Defender of Argus/Sunfury Protector/Sparring Partner. Bonus points if you also pack in a Garrison Commander. The Shaman doesn't really have a major Flamestrike-level spell to clear out the entire board. 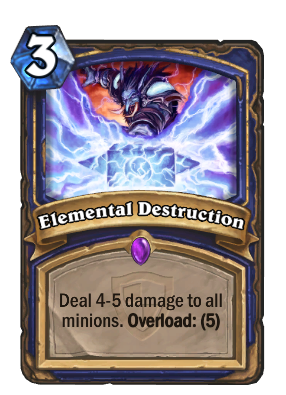 So for times that Lightning Storm just isn't enough, here's Elemental Destruction. That's assuming, of course, that you're willing to pay the insanely high Overload cost. This is among the most expensive Overload cards out there and because of that, it probably shouldn't be played unless Lava Shock is at the ready. It definitely shouldn't be played in the early turns, since it'll probably mean giving your opponent a free turn. Be very careful with this spell, as its Overload cost could make it backfire heavily. Well, that's it. Pack it in. The Shaman has won The Grand Tournament. Say good night, everyone. Needless to say, The Mistcaller's effect wins everything. 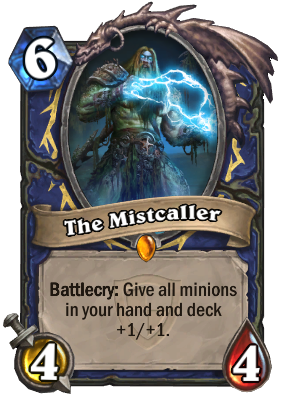 It pretty much means the Shaman needs to spend the first five turns playing board control as much as possible, warding off opposing minions, calling down totems, and even playing liberally with their Overload cards. At Turn 6, the fire can be unleashed. Opponents may not feel a necessary urgency to get rid of The Mistcaller, since the Battlecry will mean the damage is already done. Just to be safe, though, deal with him anyway, because the last thing you'll want when facing a Shaman is to have them play Ancient Brewmaster (who would be boosted to 6/5) or even a Time Rewinder to give them a shot at using the Battlecry a second time. That effect is going to hurt, friends, and there are few ways to counter it, aside from maybe getting lucky with something like Deathlord. Just start preparing contingencies now. Those are all of the class-specific cards for the Grand Tournament expansion. That only leaves 18 neutral minions to analyze. Strap in, everyone! Tomorrow, Shacknews runs through all of those remaining cards to officially bring our Inspired series to a close.